The Mississippian Period began about 1,000 years ago. It's called "Mississippian" because it began in the middle Mississippi River valley, between St. Louis and Vicksburg. This culture spread over most of the Southeast. There were also large Mississippian centers in Missouri, Ohio, and Oklahoma. 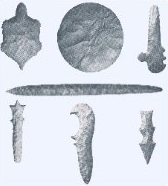 Although hunting and gathering plants for food was still important, the Mississippians were mainly farmers. They grew corn, beans, and squash, called the "three sisters" by historic Southeastern Indians. The "sisters" provided a stable and balanced diet, making a larger population possible. Thousands of people lived in some larger towns and cities. A typical Mississipian town was built near a river or creek. It covered about ten acres of ground, and was surrounded by a palisade, a fence made of wooden poles placed upright in the ground. A typical Mississippian house was rectangular, about 12 feet long and 10 feet wide. The walls of a house were built by placing wooden poles upright in a trench in the ground. The poles were then covered with a woven cane matting. The cane matting was then covered with plaster made from mud. This plastered cane matting is called "wattle and daub". The roof of the house was made from a steep "A" shaped framework of wooden poles covered with grass woven into a tight thatch. Mississippian Indians built pyramid-shaped platform mounds out of earth. They conducted their political and religious affairs on top of these mounds. Some platform mounds were 100 feet high and contained millions of cubic feet of earth. 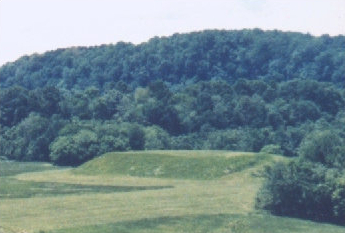 Conical burial mounds were still built, similar to those of the Woodland Period. Mississippian artists produced unique art works. They engraved shell pendants called "gorgets" with animal and human figures, and carved ceremonial objects out of flint. They sculpted human figures and other objects in stone. Potters molded their clay into many shapes, sometimes decorating them with painted designs. The Nashville area was a major population center during this period. Thousands of Mississippian-era graves have been found in the city, and thousands more may exist in the surrounding area. There were once many temple and burial mounds in Nashville, especially along the Cumberland River. One temple mound was still standing as late as the 1980's. Unfortunately, the mounds in the city have all been destroyed, but there are a few left in the surrounding counties. The Mississippian People were no longer living in the Nashville area when the first white explorers passed through. Many archaeologists believe the area experienced a sharp population decline around 1450 A.D.. Why this happened is a mystery. A change in climate may have affected their crops, or neighboring cities may have started fighting over land in the fertile river bottoms. An epidemic of some illness may have broken out, spread from town to town on the trade networks. There may have been a combination of several reasons. No one knows for sure. Exactly where the people went when they left the cities isn't known, so it's hard to say who the descendants of Nashville's Mississippian People are. No direct evidence linking them to any historically known Indian nation has been found. Some archaeologists think they may have migrated to east Tennessee. The population there seems to have increased just when the population in the Nashville area declined. But this is just an educated guess - no one knows for sure where Nashville's Mississippian People went. However, it is fairly certain that most Southeastern Indian nations are the descendants of Mississippian people in general. Some symbols found in Mississippian art seem to show up in the oral traditions of some Southeastern Indians. The Cherokee, Choctaw, Creek and other nations built platform mounds for their council houses. And they still regard mounds found in their ancestral territory as sacred places.